Meddling in the 2017 French elections is a showcase of the different methods in the Kremlin’s playbook: a mixture of personal attacks, false narratives, as well as hacks and leaks (of real and fake documents). But it is also a story about how a quick and transparent reaction, combined with broad cooperation across different sectors, can help control the damage. Various analytical institutions made it clear: the Kremlin interference played a key role in France’s 2017 presidential elections. At the same time, some researchers suggest that the Kremlin might not have been the only actor responsible. The purpose of meddling was to advance one of the candidates, who the Kremlin expected to have a more positive stance towards Russia. Nevertheless, Russia denied any involvement. Meddling in the 2017 French elections is now mostly associated with the so-called ‘Macron Leaks’. In this incident, 9 GB of data were stolen from the computers of Emmanuel Macron’s campaign staff, including the candidate himself. This might have been the most prominent example of interference – but it certainly wasn’t the only one. In the first months of 2017, when the presidential election campaign was starting to gather pace, pro-Kremlin outlets were much keener on reporting positively about Francois Fillon and Marine Le Pen, as a DFR Lab study shows. At the same time, the biggest wave of criticism, incomparable with what other candidates were faced with, was directed at Emmanuel Macron. Opinions about the candidate’s lack of vision or programme are a rather usual thing – but in this case, RT and Sputnik stopped at nothing short of mockery and personal attacks. Narratives varied from describing Macron as a pure marketing product, to his alleged “homosexual orientation”, to being an American spy, to being supported by Saudi Arabia and the Rothschilds. And this line of disinformation attacks became stronger as Macron started advancing in the polls. 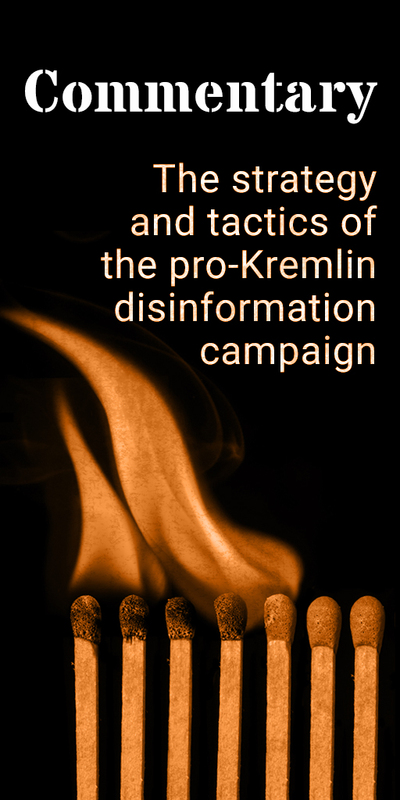 This kind of smear and disinformation campaign is a classic in the Kremlin’s playbook. It is also standard to diversify the attacks, narratives, and areas of action to make the meddling efforts more effective. This is why the campaign against Macron did not stop at the level of media and social media. It also went deeper underground and into cyberspace. First, already at the outset of 2017, email accounts of Macron’s close collaborators were hacked. But it took long enough to make the hacked data public. The data leaks occurred in the last hours of the second round of the presidential campaign – right before the purdah period, when media and candidates have to refrain from electoral agitation. The #MacronLeaks managed to go viral just before that, with a mixture of real emails exchanged between campaign employees and absurd fake messages. A few days before that, a different series of false messages was activated under the #MacronGate hashtag – this time, they were based on two fake documents which were supposed to prove that Macron has a secret offshore account. In a nutshell, the strategy was as follows: to spread many false narratives via different tools and methods – and then wait for them to be amplified, first with help of ‘hacktivists’ and the ‘cyber underground’, then social media, and finally the traditional media. There was also the expectation that, in the meantime, ordinary citizens would get involved too. The whole strategy was not solely about discrediting one of the candidates; it was also about sowing doubt about democracy, the leadership, and one’s ability to exert any influence on the democratic system. Personal attacks, hacking, falsifying documents, disinformation, false narratives – in the 2017 French elections, everything was there. Nevertheless, if the aim of meddling was for Emmanuel Macron to lose the election, apparently it did not succeed. What went wrong for the Kremlin? The strategy applied in France can be summarized in three words: reaction, preparation, cooperation. First of all, meddling attempts were met with reactions from across different sectors. Then-presidential candidate Emmanuel Macron and his campaign aides were clear in labelling RT and Sputnik as pro-Kremlin disinformation outlets. After Macron was elected, they did not become part of the press corps at the Élysée Palace and have been regularly refused in covering official events. 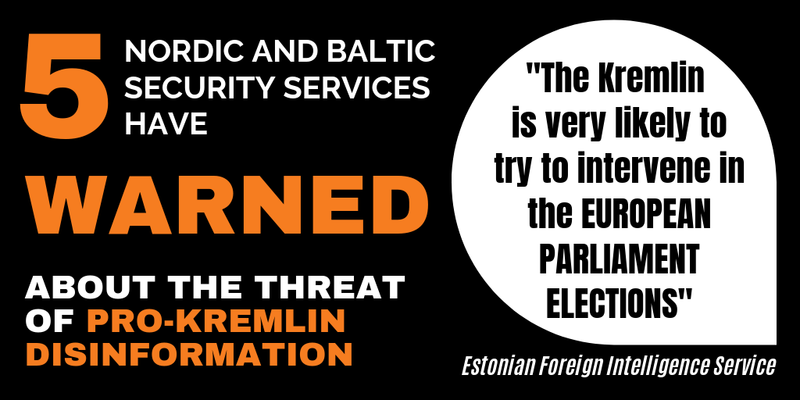 Also, legal steps were taken: In December 2018, a new law was adopted with the aim to fight the spread of disinformation. 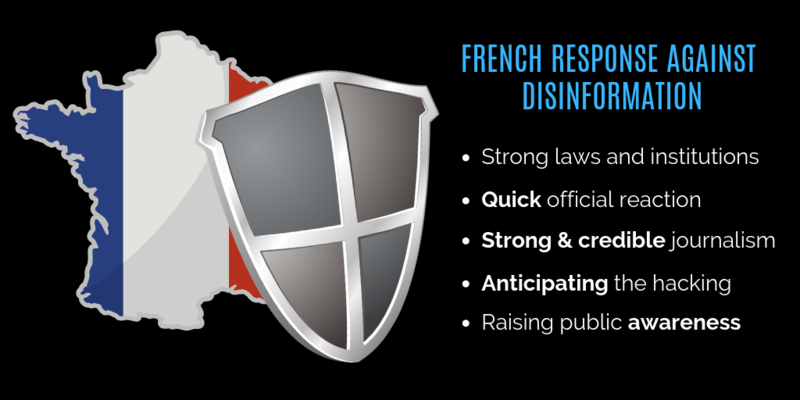 French journalists did not let disinformation fool them – they did their job and checked the sources, claims, and messengers conveying them. Thus, they responded with research and reliable data. For example, the ‘Macrongate’ story was quickly debunked by The Observers (a collaborative project under the umbrella of France 24). Other journalists followed suit. The story did spread across social media, but without the quick reaction of the media, it could have become a mainstream narrative. In the case of the Macron Leaks, the environment of the presidential candidate reacted quickly, too. On the one hand, they did confirm that real emails and messages were indeed part of the leak. On the other, they used the lively environment of social media to engage in conversations about it, with a clear narrative about the content of the leak: they were, actually, part of the usual actions taken during an election campaign. Emmanuel Macron’s campaign staff also used the opportunity to do something out of the box: play with those who were behind the hacks and leaks. They planted some absurd false messages and documents in their own networks, in order to confuse the hackers and burden them with the necessity to explain why they leaked false information. How was it possible to do the latter? Because the campaign staff actually anticipated that their computers and communications would be hacked. And that, in turn, was possible thanks to their cooperation with digital platforms and state institutions. The latter is of crucial importance here, as strong institutions are fundamental to secure the democratic process in France. Moreover, France learned from the experience of other countries, especially the 2016 American elections. It could therefore prepare different scenarios and reactions as well as adapt the experience of others to its own situation. The essential element of raising public awareness was included in the reaction, too. Here, again, French institutions played their part. For example, they continuously informed citizens about the risk of disinformation and cyberattacks and offered workshops for campaign staff. Everybody thus had the opportunity to prepare. All in all, knowledge that meddling will happen made it possible for the institutions and campaign staff to prepare for different scenarios and make everybody aware of the risks. This, in turn, became real because none of the actors involved in the election process operated in a vacuum – information was exchanged and resources activated across governmental and non-governmental networks. Finally, a quick and transparent reaction ensured that the truth was out there, providing citizens with all resources needed to make an informed choice. “In France, RT Is Getting No Love“. (2018). EUvsDisinfo. “Information Manipulation. A Challenge to our Democracies“. (2018).The Policy Planning Staff (CAPS, Ministry for Europe and Foreign Affairs) and The Institute for Strategic Research (IRSEM, Ministry of the Armed Forces). Popescu, N. and Secrieru, S. (2018). “Hacks, Leaks and Disruptions: Russian Cyber Strategies“. Chaillot Papers No. 148, EU Institute for Security Studies. Conley, H. and Vilmer, J. J. (2018). “Successfully Countering Russian Electoral Interference“. Centre for Strategic and International Studies. Aaltola, M. (2017). “Democracy’s Eleventh Hour: Safeguarding Democratic Elections against Cyber-Enabled Autocratic Meddling“. Finnish Institute of International Affairs. “The French Election Through Kremlin Eyes“. (2017). DFR Lab, Atlantic Council. “How We Debunked Rumours that Macron has an Offshore Account“. (2017). The Observers, France 24.